We are manufacturer and supplier for Antique furniture for home, recreating the magic of good old days. The home furniture is crafted by our skilled craftsmen to present it an eye-catching look. We are using superior quality wood from the reliable vendors of the market to manufacture wood furniture. We hold specialization in offering furniture for home to our esteemed clients, in various sizes and designs to meet the needs and requirements of the clients. Aarsun Woods provide a wide range of wooden furniture for home and gives a collections brings simplicity and elegance to your living room. The collection comes with your choice of dressers, chest and beds. This Wooden bed is made from sheesham/ teak wood.This furniture is perfect to complete the look of your home. These various sizes of bed allows for greater comfort and space to one and all. The bed is a made to order product and easily customizable as per your need. This bed is long lasting, durable and very strong. Besides giving maximum comfort, this furniture will bring a touch of class, style and grace. 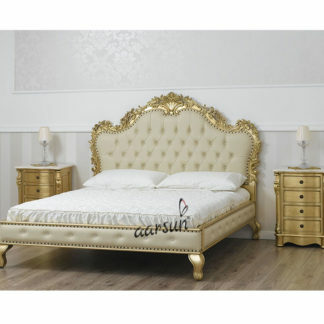 This Beautiful Bed made of fine quality sagwan wood with deep and detailed carving. The head board of this bed is lavishly carved over solid teak wood with matching carved foot board. A well designed handmade Wooden bed should provide a restful sleep, pleasing appearance, appropriate functionality and durability for generations. It is hand crafted from teak wood by finest of artisans. This bed will transport you to the luxurious times of the eras gone by, and remind you of everything that you have read of the earlier decades. So, lay your hand on this bed to add a touch of evergreen elegance to your room. Augment the look and feel of your bedroom decor with this impeccably crafted bed. Aarsun Woods have been providing handmade furniture for home in India as well as abroad keeping in mind the exact requirements of the clients. We have a range of products that are highly customizable: be it large living room furniture sets, dining room sets and Temples or small wooden tools and accessories for kitchen. Contact us at +91-8192999135 / +91-8266888634 for details regarding delivery time-frames and manufacturing time.